Sports injuries can have a serious impact on your well-being , as well as stopping you from enjoying some of your favourite activities. A biomechanical and orthotics assessment at Sandy & Bielby LTD could help you get back to living your life the way you want to. Knee Pain is a sensation of pain in one or both knees. The pain may arise in and around the knee joint for example on the outer or inner side of the knee. The knee is very sensitive to biomechanical mal-alignment. Normal knee function relies on an efficient functional relationship between biomechanics of the foot and ankle. When either of these are out, the knee will begin to function abnormaly and so become prone to injury. Foot posture is often overlooked as a cause of knee pain. If you suspect that you have a knee problem that is caused by the posture of your foot you should arrange to see our qualified clinicians. 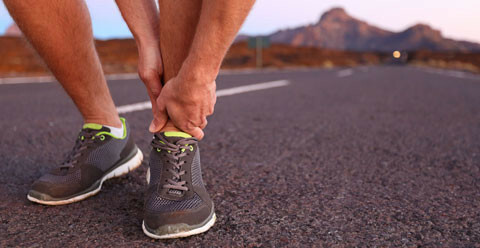 Shin splints is a general term used to describe exercise or overuse induced pain in the front of the lower legs or shin. Shin splints is characterized by either the separation of the leg muscles and “fascia” from boney attachments, or the over exertion and subsequent discomfort of any of the inner part of your shin.